So we’ve all heard of the Lumia 900s connection problems and the amazing lengths Nokia has gone to correct them- issuing what is possibly one of the fastest updates in history (less than 4 days) and having it pushed out by At&t to all phones is no simple task (Carriers usually delay updates FOREVER! – if anything this is a sign of how deeply At&t are committed to the Lumia 900s success). 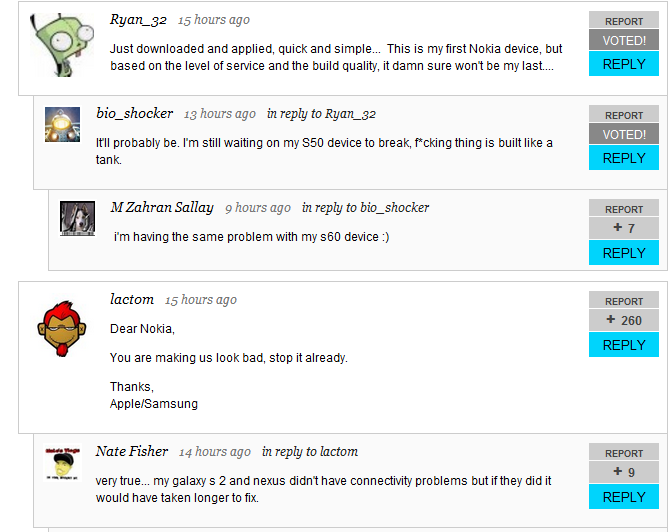 What surprised me most was that in most of the comments I’ve read (on the verge, engadget, Cnet and many more) were surprisingly positive; besides the usual “NOKIA IS THE DEVIL DOWN WITH ELOP! BRING US THE McRIB!” most of the commenters seemed overly impressed with the speed and swiftness that Nokia dealt with this problem (of course $100 of credit doesn’t hurt).